Tucked away in the La Joux village close to Argentiere, this pretty newly built chalet offers fantastic ski and summer accommodation and fabulous privacy in some of the most beautiful landscape anywhere in the world. 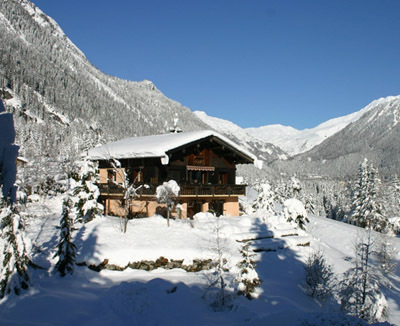 Set out over three floors the chalet consists of three studios on the ground floor with 2 bedrooms on the first floor. These are accompanied by a shower room, fitted kitchen and living and dining rooms. On the second floor is a large en-suite bedroom, providing an excellent retreat in a real mountain hideaway in a sought after Alpine hamlet. The Chamonix Valley is dominated by Europe’s highest peak, the Mont Blanc at 4807m, from where Chamonix-Mont-Blanc gets its name. As the valley road winds its way towards the Swiss border it passes through the villages and areas of the Chamonix Valley. Just outside central Chamonix we find ourselves in Les Praz and Les Tines and move towards the charming village of Argentière and the higher hamlets of Montroc and Le Tour. Chamonix itself is a year round destination mixing traditional winter sports with summer activities including mountain biking, trekking and climbing. To this end it is busy throughout the year and the town is bustling and energetic, containing nearly 150 bars and restaurants. €1,450,000. For further information please contact Matthew Hodder-Williams at Knight Frank on 0207 629 8171.